In this new 7-hour video course IM Arthur Shen REVEALS his entire chess opening repertoire for Black, which allowed him to go from 1400 to over 2500 Elo! This course includes a powerful toolkit on how to conduct strong and vicious attacks against opponents of any level. 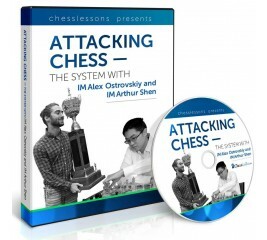 We are very delighted to finally bring you a universal system of attack that helped IM Alex Ostrovskiy and IM Arthur Shen at beating many strong and very strong opponents.